Along the way as the internet got more popular and we began to see growth in sales of inwall speakers and the accessories, we put more energy into the website and less into crawling around in attics and basements. We're still a small company and we really care about providing a great product at a good price. Thank you for visiting and hopefully buying from us...you'll be glad you did. 1. We have shipping locations in each lower 48 state's 4 time zones. 2. We have our first dollar made on display. 3. We have 2 "That was Easy" Staples buttons. 4. We use mostly Apple computers. 5. Our wall plates originate in Shanghai Mainland China. 6. We don't keep credit card numbers written down for more than a day (security shredded after that). 7. Everybody in the company sees all our emails. 9. We use Voice Over Internet type phones. 10. 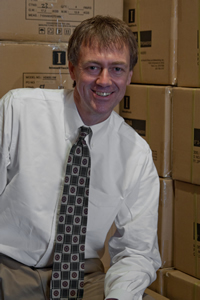 We use a fulfillment warehouse for all our storage and shipping. 11. We celebrate "Maple Bar" Thursdays. 12. Two of us went to the same High School. 13. We use colored paperclips. 14. During the summer, the whole office might take a waterskiing lunch. 15. In 2005 the whole company went on vacation in Puerto Vallarta and we did business from there! 16. Our first order from the website came in while the owner was on vacation....again in Mexico. 17. We keep cute animal day calendars and tape the cutest ones up on a wall. 18. We have casual Fridays...and Thursdays...and Wednesdays...and well you get it. 19. We own a Prius for company errands. It's red. It has a license frame that says "...ya it's got a Hemi". 20. The current website is the 6th version of redesigns in 10 years. 22. We've wired 12,000 square foot houses in the past. 23. We still have pictures of most our installation pre-wires. 24. We have a live person ALWAYS answer the phones after the first prompt and we use a live person message taker service if we can't answer ourselves. 25. We take it personal to get it right.